(reposted) Let’s go to Banyuwangi…! part. 3 – "da Trooper Bali"
Raden Banterang known as a helpull and nice guy. The people love him very much for his good behavior. The people very respect to him and in the same time fear at him especially the people who often make a crime. If Raden Banterang see anyone make a bad things, without thinking how and why, he will judge and varnish them at once. This is behavior will regret him latter on. As a young handsome guy and known as a King’s son, there is so many beautiful pretty women falling in love like crazy to him and wants to marry him, but so far none of them are interesting to Raden Banterang. Raden Banterang still like to hunting do a combat to anyone that seem so strong. He wants a new challenge and to be number one among the people. Raden Banterang hurry his steps and moving his head and trying to find out where is the source of that voice. He then jump to high tree and look around to found the voice. He so surprise when he saw three man haunt a young lady with wear a torn trousers and shirt. He jump and fly among the tree and in a second he is already in front of those three bold man, who already catch those young lady in his hand. “Let the girl go.” He shouting to those three bold man. Those three bold men look at him and laughing openly. “The man who catch the young lady then left the young lady. He move to Raden Banterang anda ask: “Who are you…? Why you want to involve disturbing my happiness…” He said after he finish his laugh. Raden Banterang fold his hand in front of his chest and said :”I am Raden Bantering the son of the Prabu Menak Prakosa, the King of Blambangan. And I hate a man like you who only cold brave to a girls.” He said. Those bold man so surprise, his face change and seem soscare, but only a second, Raden Banterang already hit both of them in one time and make them throw away with a blood on their mouth and they die together. After the two bold man die, Raden Banterang look at the young lady who is still trembling after watching how Raden Banterang kill those two bold man only in a second. She is seem so scare. Raden Banterang smile at her and said “Don’t worry I am not a bad guy. I will help you young lady.” So who is your name…? Those young pretty girl seem so surprise and fall her self in front of Raden Banterang and said : “Please forgive me your majesty. I am a stupid girl by not knowing that you are Raden Banterang the son of the King of Blambangan.” She said. 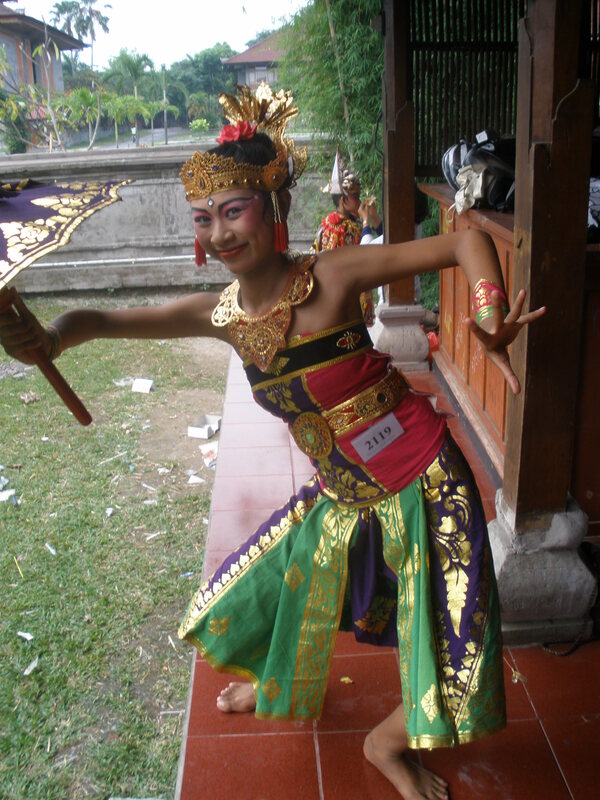 “I am Dewi Surati.” .”I am only a village girl.” She said again. “ I am escape from my village as my village destroy by those two bold man and their people. My parent are die killed by those two bold man.” I am escape from my village, but those bold man saw me and follow me until you help me from their dirty hands,” She continue again. It’s alright. Now please stand .” Raden Banterang order those young lady. He is heart suddenly beat faster. Since he saw that young lady at first, he falling love at the first sight to those young pretty lady. It seem that this young lady is not a ordinary people. But he did not know who. “So where will you go now Dewi Suati…? Asked Raden Banterang to the young lady. “I do not have any things anymore your majesty. No parent no house and no family at all. Said those young girl And she same very so sad. “I do not know where I must go now.” She continue with in a sadness. “Alright. Dewi Surati. I will introduce you to may parent. Would you like to see them.” Raden Banterang replied. “No your majesty. It is impossible. And I am very scare to see them. I am only a village girl your majesty.” Replied Dewi Surati. “it’s okay Dewi Surati. You will stay with me in the palace.” Said Raden Banterang while he push Dewi Surati to agree his request. “What…. What….. What that mean your majesty…? Ask Dewi Surati. “I am the open mind people Dewi. If you like, would you please to marry me Dewi Surati….? Asked Raden Banterang with doubt. ‘Ah Raden….your majesty… you are do wrong choice your majesty. I am only a poor simply village girl. Does not knew any things about the palace. I am afraid would not serve you in the right way your majesty….” Said Dewi Surati again. “It’s okay Dewi. Don’t you mention that again. okay..? closed Raden Banterang. He swift his hand and grab Dewi Surati hand and pick her to get into the horse. And those couple move to the Blambangan Palace. Raden Banterang is the type of a man who can decided in instant. He is so wonder about the face of Dewi Surati. Her face is really really pretty beautiful. He not need to investigate who is Dewi Surati, where she is came from. Completely not needed. He already falling in love with the first sight. He feel so closed and so familiar with this young lady. But he is not a stupid people. Before he introduce Dewi Surati to his parent, he keep her in one of his shoulder and ask the palace women staff to bring every things needed for women to Dewi Surati, including the women wear to be worn by Dewi Surati. When Dewi Surati finish making up and properly dressing, every body who see her in proper dress are open their eyes widely, because Dewi Surati is really really pretty and beautiful. Dewi Surati become like a goddess from the heaven. And she is the one who is necessary and good to be the wife of Raden Banterang. She is not only pretty and beautiful, but her behavior also is very nice like the prince of the kings. Prabu Menak Prakosa himself, wants that Raden Banterang soon marry and wants has and grandchild soonest. Therefore, when Raden Banterang introduce Dewi Surati and want to marry her Prabu Menak Prakosa agreed and prepare the wedding for his son urgently. The wedding ceremony are great and held for three days and three night continuously. Every people of Blambangan are happy with the wedding of Raden Banterang and Dewi Surati.. The days gone with fully happiness with those couple. Prabu Menak Prakosa and his wife love Dewi Surati so much as Dewi Surati always shown her respect and love to anyone. Prabu Menak Pakosa and his wife so proud about Dewi Surati. She is not only has a pretty beautiful face, but her attitude also beautiful which is make everyone love to her as well. She is seem not so difficult to socialized her self to every one in the Blambangan Palace. This is of course make everyone quiet strange, as usually if the country women will facing difficulties during socialized herself with anyone in the palace. She is clever, read and writing. “She is like a prince. “ Said the King wife. “Yes she is very clever read and writing. Our son so smart to choice the wife.” Said the King Prabu Menak Prakosa. All of the Blambangan Palace also very proud and loving Dewi Surati more and more every day. Dewi Surati very pleasant stay in the Blambangan Palace. Month passing so fast, and years goes by. After three years of their wedding the problem coming to them. After three years marry, Dewi Surati seem not pregnant yet. Prabu Menak Prakosa who is wants to have a grandchild soon since the beginning Raden Banterang marry her, and he quiet disappoint with the fact and also the King’s wife seem very disappoint.. Dewi Surati very sad as the King wife always shown her disappoint and shown her dislike to Dewi Surati. Dewi Surati began to keep herself alone. She often sit in the side of the fond in front of her house, thinking about herself who has no child yet. “The only the King Prabu Menak Prakosa seem still love me, while my husband Raden Banterang also seem so disappoint on me.” She talk to herself sadly. “Why every body changes…? “ She talk to her self once again. “Oh God, please help me…” She whisper to herself. Dewi Surati know as a nice lady. She often give her helping hands to the poor people. Almost every day the poor people come to her asking a cup of rice or any food to eat. Someday, there is a poor man come to her. He is wear a torn dirty shirt. Those man not so old. Dewi Surati so strange see that guy. And she feel so familiar with him. She try to compile her memory. In the part those poor man see herface so sharp, which is make Dwi Surati trembling and feel so scare. The eyes of the guy look like so angry. Suddenly the poor guy said: “Supraba…! Now you change your name to Dewi Surati. Although I wear this torn dirty shirt, I believe you would not forget me don’t; you…? “ His voice heard like angry. Dewi Surati knew the voice. It is true that the guy is her brother Cokorde Bagus Tantra.!! “Oh my brother Cokorde Bagus Tantra. The God finally fulfill my prying and give us a chance to meet.” Oh my brother I am so happy to meet you again.” She said in gladly. “Don’t say my name..!! !” Shout Cokorde Bagus Tantra. “You change your name even you marry our enemy. The son of the people who killed our parent.” He continue. “You have forgot our goal to revenge and kill our enemy. You are not and my sister anymore.” He shouting again. “Please don’t say like that my brother. I am still Dewi Supraba your sister just like before.” I change may name to hidden from our enemy who always follows.”. She explain. “Alright, but now you marry with our enemy.” Shouting Cokorde Bagus Tantra in angry. “My husband were not join in those battle to attack Bali Island.” Dewi Surati try to defendant from her brother. “Alright, but now you are marry with our enemy.” Shouting Cokorde Bagus Tantra in angry. Follows the continuation of this legend….